Ferrari unveiled their F10 for the new Formula One season on Thursday, confident the radically redesigned car would be much more competitive than last year's inconsistent version. 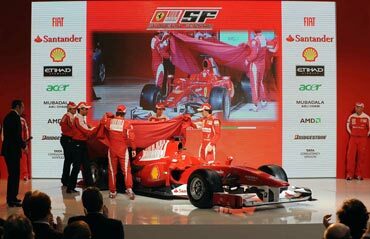 At a lavish ceremony at the company's road car factory, with workers building commercial vehicles in the background, Ferrari drivers Fernando Alonso and Felipe Massa helped whip off the covers to reveal the car the Italian team hopes will win back the world championship. "It's a very important season for us. We come from a season, which was not positive. We have the potential with everything we have to do well," team principal Stefano Domenicali, who oversaw a lowly fourth place finish in the constructors' championship last year, told the audience. The car is longer than last year as the ban on mid-race refuelling has led to a much bigger fuel tank, which is almost double the size of last year's and has been redesigned in any case to try to boost performance. Like all F1 models this season, the front wheels are narrower and the brakes have been modified, as the fuel-heavy car will weigh much more at the start of races than before. The engine is type 056, the chassis is a carbon-fibre and honeycomb composite structure while the diffuser is much bigger. 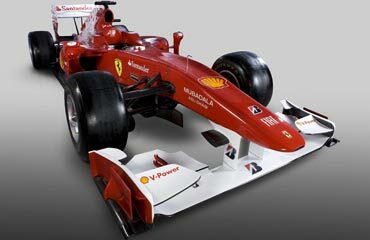 The traditional red colours of Ferrari are still prevalent but the wings are white this year to accommodate the name of new major sponsor Santander, the Spanish bank. Ferrari boast another new Spanish influence in former double world champion Alonso, who has arrived from Renault, while Massa is fully fit again after suffering life-threatening head injuries at July's Hungarian Grand Prix. 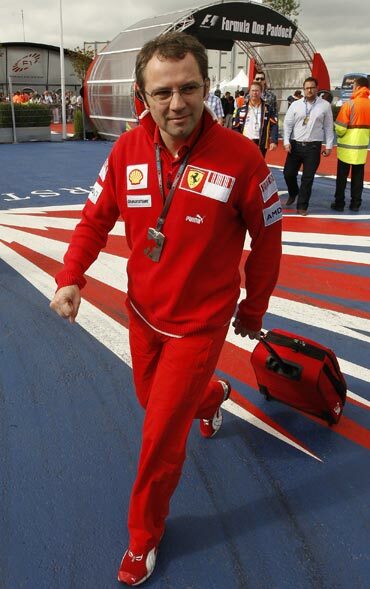 "We have two new drivers," Domenicali said with a smile. "We have two extraordinary drivers from a professional and personal point of view." Massa is due to take the new car for a short spin later on Thursday for a promotional video but tests are not allowed until the official sessions for all teams in February in Spain. "It's a special presentation for me after everything that happened in 2009. I hope this really is a competitive car and we can fight for the title again," the Brazilian said. 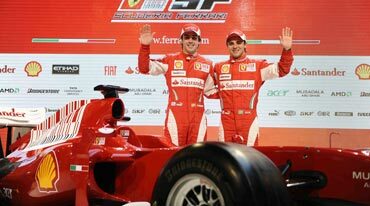 Alonso, who labelled the car a "dream", added: "It's my first Ferrari presentation. It's emotional. We are ready to take on the responsibility of getting 100 per cent out of this car."